The Assembly Rooms were designed by John Wood the Younger in 1769 but were bombed in 1942. 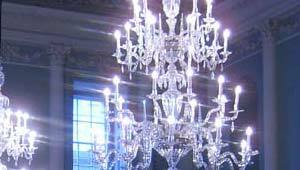 They were subsequently restored and you can fully appreciate the magnificent rooms as they used to be. As such, many period movies like “The Duchess” with Keira Knightly, and TV shows have used the rooms as locations. Occasionally some rooms are out of action to visitors because of private functions like weddings but all the rooms are impressive so if you only see one of them, it’s still worth the walk up the hill from the centre of Bath. You’ll find them between Bennett Street and Alfred Street near to the Circus. The Assembly Rooms are open daily from 10.30am (except 25/26 December) until 5pm in the winter and 6pm in the summer. The rooms are owned by the National Trust and Admission is free for members but £2.50 for everyone else (2014 prices). There is also a council run Fashion Museum on the lower floor, for which there is a fee to enter.